Melissa, who sent this, swears I've shown it before, but I can't find it (I REALLY need to add those pattern number tags). Here's the line drawing, and my question: Where would you put the pockets? Obviously, it needs pockets, but where? Patch ones are such a pain. I think I would do two small in-seam pockets hanging from the wrap waist seam — just big enough for a lipstick, a driver's license, and a couple folded bills. I have that pattern. Go for the bright pink seersucker. I think I have enough 60s pop pique for mine… white with pink and lime green pattern.you are such an inspiration for me to start clothes sewing again.Like I need another obessession. I have that pattern too! The vintage one. I had been thinking about trying to make it for a while, but I think I may be too short to wear it. Are there darts on the front? Is that where you mean to put the pocket? That is what would make sense to me.I’d love to see it in the cherry print, with gingham binding. Or the bright pink seersucker with lime green binding. There are so many fun possiblilties with this dress. the option of adding a second fabric makes it even more fun. Ohhhhh. That one has been on my E-bay list (unsuccessfuly) forever. Thank you! Thank you!And yes, it cries out for seersucker. What about welt pockets like this:welt pocket directionsP.S. I love your blog!!! I actually made this dress a couple (ok, like 5) years ago–measure carefully! The sizing was wacky. Oh dear. There goes this month’s clothes budget!Looking forward to making this for sure. I have also made this one up, several times, and I heartily suggest it for a more formal look as well as the obvious picnic-wear. I made it twice in irridescent taffeta, one pink and one emerald green. Now I’m making it in pink cotton plaid with orange binding. I’ll have to add the pockets (I think patch, on the front panel). Am I a total geek for looking at the illustration and thinking, “Boy, would it be easy to take those parts from patterns that I have that I know already fit me and combine them to reproduce that effect”?I see here a fitted sheath dress with, perhaps, slightly extended sides. The back of the sheath is cut off at the waist (the darts curve in, but not out again – that tells me it’s cut off at the waist), and a half-circle skirt is added to the back shift piece. And I gave full instructions on how to cut a half circle skirt without a pattern a few posts back.The other main difference, of course, is that the underarm seam has been eliminated. Ladies, if you have patterns in your stock that already fit you, and you’ve been frustrated by this one, you may want to get out papers, pencils and rulers, and try your own personally-fitted versions.And you could even add pockets.Oh, and Meredith? What, they only had six-foot-tall or taller women in the fifties? Five foot four is the average these days. I bet it would look darling on you. As long as it’s proportioned to fit your body (you know where your knees are!) (and “you” means “everyone”), it will look just fine. I have that pattern, too! I have contrasting prints in green and cream that have been sitting around since I was in 3rd grade that I’m planning to sew up into this dress as soon as I have time. And every time I see the fabric and the pattern together, I think about how fun it would be to sew it up in the contrasting 4-H prints that are available occasionally. Those puffy skirts must take up tons ‘o material. I usually need about 2 1/4 yds total to make a dress. But I mostly like mod styles so they’re usually shortish and not really gathered. It’s really cute though. you are awesome! I just bought my copy of the pattern yesterday! I hadn’t looked here in a couple of days and was thinking that this was a pattern that you might enjoy too. I have missed this pattern so very much and am overjoyed at its return. I have fabric to make 3. 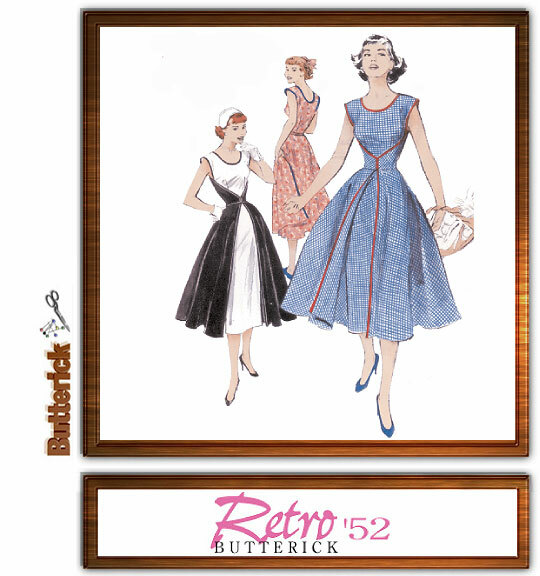 I also bought the vintage dress that was a page ahead in the Butterick catalog. can’t wait…must sew now. Good luck with the pockets. And you know what’s sad? I, too, shall buy this pattern – even though I have no access to Hancock’s or JoAnn Fabrics, and must therefore pay Good Cash Money for it – and even though I shall doubtless wind up making the same sorts of modifications I suggested above.I just love patterns. Patterns and fabric; fabric and patterns. Fabrics and patterns and trims: these are a few of my favorite things! Thank you so much for posting this! I have some fabric I’ve been dying to use for a dress but just couldn’t find the perfect pattern – and here it is! This will be my very first project when I get back from vacation. wow. I just ordered this pattern! It’s gorgeous.Now, em, I need to buy a sewing machine.Do you have any recommendations of good machines for rank beginners? There is a review of this pattern on PatternReview.com by MelissaB followed by comments. She wears it without petticoats and it looks quite good on her.http://sewing.patternreview.com/If you have not been to Pattern Review before, just scroll down to Sewing Reviews > Sewing Patterns, Choose Pattern Company: Butterick, and click search. Then Scroll to the bottom of that page, Choose Pattern Company: Butterick and enter pattern number 4790.
this is to cute where can i get the pattern? HELP! I NEED AN ANSWER!Hello everyone. I made this dress for my daughter’s pre-school teacher and it fit her just wonderfully. She is a very petite woman and I saw her actually wearing the dress on Valentine’s day and I was so upset. The back circle skirt of the dress pulled her shoulder seams out of place and that made the entire front of the dress look ill-fitting AND also caused the front skirt to bunch up. Has anyone else had this problem? Also, what can I do to fix it? Is there any way to weigh down the front of the skirt to keep things in place? Rachel, I haven’t made this one myself yet so I can’t help with this issue … have you looked on patternreview.com? No, I haven’t. I’ll check it out. So funny, I just made this dress. The blog post goes up tomorrow. I don’t see where pockets could sensibly be added. It’s a supper easy dress to sew though so if you wanted to play around with it.